O’ Canada: I know you changed the name of a Province not too long ago… Right?!? I’ve got to stop making bets with my wife that I lose. She tells me that she never makes a bet that she will lose, however I try time and time again. So after my wife and I set him straight (with a little help from Siri to reinforce the point) we decided to have a discussion about the provinces and territories in Canada as a family. Note: I think he gave in because he 100% trusts what his mother tells him, clearly more than what I have to say, because mummy is a teacher, and teachers know everything! In our discussion I mentioned that recently – within the past 10 years – Canada added a territory and changed the names of a province and a territory and that I did not believe it was Newfoundland, but I was not sure. So we discussed, they called me crazy, we discussed some more, they were convinced I was crazy and we left it at that. Later that evening we had friends over and with all 7-children in the basement playing I again brought this up to our distinguished guests and after my explaining that there was a recent name change or 2, there were now 4 additional people calling me crazy. The sticking point here for my wife was that when she was in school she was taught that the province of Newfoundland was really Newfoundland and Labrador and if this was the name change I was thinking of, then I cannot say it occurred “recently” because 1949 was not recent. I agreed. On January 4th, 1999, Nunavut split from Northwest Territories. Nunavut was assigned “NU" as its province code in mid-2000. 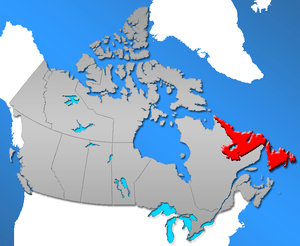 On December 6th, 2001, an amendment to Canada’s federal Constitution Act officially approved a name change from the easternmost province of Newfoundland to the province of Newfoundland and Labrador. The move for change began in the early 1990s to provide “symbolic but important recognition of Labrador’s status as a full and vital partner within the province, with its own unique geography, history and culture.” On October 21st, 2002, NL was recognized as the provincial symbol for Newfoundland and Labrador, replacing NF. On January 1st, 2003, The name of Yukon Territory was changed to Yukon. So Dads, if you ever decide to Google the term, “I was right”, you will probably come to this post. Not only was I right, but I educated 5 adults, 7 children (and myself). The long weekend that was and the (short) week ahead. The weather was incredible for this past long-weekend up here in Canada, eh? We pushed 40 degrees celsius here in Toronto with the humidity which for you US folks is 104 fahrenheit. For most of the 3 days there was not a cloud to be seen. Aside from almost getting myself and 4 children sandwiched between a parked car and an empty car reversing out of a parking spot by itself. the weekend was fantastic. Here is why, followed by “What to Expect” for this upcoming week. 1) Fresh fruit and vegetable picking at Whitamore’s Farms netted us some green peas, red potatoes, raspberries and strawberries. The sucked back the raspberries before we got home because they were the first crop of the year and so very yummy. 2) Sunday was our 11th wedding anniversary. Steel for those of you playing along at home. 3) Sunday was also Canada’s 145th birthday and the highlight was my 3 kids in their Canada t-shirts marching through the house waving Canadian flags and singing “Happy Birthday Canada” at the top of their lungs. 3) We had friends over each day to hang out, BBQ with and chill out with. 4) Bought a big boy bike for Linus whom I will teach to ride without training wheels in July. 5) Bought a tricycle for Berry who, once she got the hang of it, was having a great time. 6) Did a lot of cleaning and getting things done. Our garbage can is over-flowing as is the recycling bin. 7) Had a fight with the family of raccoons living on my neighbours roof. As the weekend went on whenever they saw me and the jet feature on the hose they ran like hell. See, they are really smart. This family of 6 are out all times of day and night, their poo is everywhere, they scare my kids, and we cannot use our beautiful backyard patio set. Today I get even, hiring a raccoon exterminater because in Toronto you cannot harm the poor things and our green bin program (wet waste – food scraps) is feeding these vile breeding machines. Another sponsored post upcoming on In-Vitro Fertilization (IVF) aimed at our friends in Alberta. This would be my 4th post on this topic. An exciting giveaway from the great folks at What to Expect When you’re Expecting. Some insight into Community television, specifically Rogers Cable 10 and what they offer for the general public and Daddy bloggers like me, to allow us to take our talents to the television screen… For free. And of course some funny comments from the Urban Daddy clan including freckles to eat. Yum. So please, stay tuned and take a moment to post what you did this fine weekend. Remember it’s also the best way to attract new readers to your blog. I wanted to post this last week when it happened but did not get a chance but since that night this scenario has come up over and over again, just not to the same extent. The night it first happened, was a special night in the Urban Daddy household. Determined to get back into some semblance of an exercise routine, I made up my mind early in the day that I would run on the treadmill that evening, by hook or by crook. Since I’m still within my 3 month window of a new job with much greater responsibility, and the stress / excitement of meeting new people, learning new systems, figuring out acronyms and being on my toes all the time, I have found myself quite exhausted by about 10pm, which means that is around the time I tend to fall asleep on the couch when trying to; watch TV, read, blog, play Cityville, or… exercise. Very unusual for me as I’m used to 1-2am sleeps with 6am wake-ups. This night was exercise night and the beginning of a new schedule for me. Berry and Stewie before bed snack. All kids in bed by 8:15 and I’m going to treadmill for 1/2 hour before I have a shower, then run out to grab milk. I really want to begin getting to bed at a reasonable hour – it is currently 12:33am so that is not happening. Urban Mummy wanted to talk to me. We didn’t talk much the previous night and she barely saw me today and she wanted to chat but I patted my flabs and said, “Sorry hun! I have to treadmill”. She was disappointed. Walked into Stewie’s room, and surprisingly he was still awake. “Stay with me, Daddy”, he said. “Sorry kiddo. I have to treadmill right now so I can shower, get milk and talk to your mother before she falls asleep or kills me”. I went from there to Linus’ room where he was sitting up in his bed too. “Lay with me, Daddy and tell me a story, please”. “Can’t buddy. Have to go treadmill before mummy goes to sleep. He gave me his pouty disappointed face. Out I marched and right into Berry’s room where surprisingly she was up too. “Rub my back and stay with me Daddy”, she said. 4 people wanted me to stay with them and 4 people got nothing. Like I said in the title. Go big or go home. If you’re going to disappoint someone you might as well disappoint all of them. Dads… You turn. What would you have done?